GRAFENWOEHR, Germany — Whether you are taking a fun bike ride with the family, using a bicycle to get to work or as part of your fitness routine, make sure that safety is your primary concern. This guide tells you what you need to pay attention to in order to stay safe when you take to the road on a bike in Germany. Two independently acting braking devices. Bell/horn for dispensing acoustic warning. A non-blinking front headlamp of white or pale yellow color to illuminate the road and a red rear tail light that stays lit when stationary. A white reflector in the front and a red reflector in the rear. You must have at least two yellow reflectors on each wheel. Helmets are not mandatory, but strongly recommended as they protect against the risk of serious head or brain injuries. Some cities have adopted helmet laws for young children. Check with your local authorities to see if this applies in your area. Bicycles are legal traffic. They must be on the street with traffic and ride in the direction of traffic. 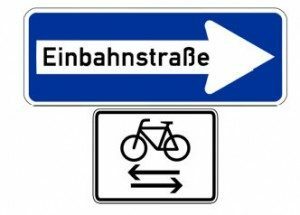 If there is a bicycle path, you must use it and not ride on the street or road with traffic. Children up to age 8 must ride on the sidewalk, not in traffic. Children up to age 10 are permitted to ride on the sidewalk. Riding side by side is forbidden on streets and roads. You must ride single file, even in bicycle lanes marked out on the streets. You must give a hand signal for all turns. Point left with the left arm, and point right with the right arm to signal turns. The signal for stopping is one arm extended and the forearm pointing down using the arm most likely to be seen by the traffic. If you are coming from a sidewalk, parking lot, driveway or the like, you must yield to all traffic on the priority roadway. An intersection with only one painted crosswalk means that you may have to use that crosswalk. If you walk your bicycle across, cars are required to stop for you. If you ride your bicycle across, you are no longer a pedestrian and laws relating to pedestrians no longer apply to you. 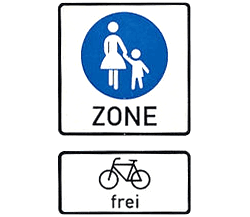 When riding in a pedestrian zone, you must push your bicycle if the pedestrian area restricts bicycles. If bicycles are allowed, you must ride at walking speed. Normally, cyclists cannot ride against the flow of traffic on one-way streets. 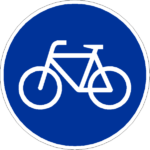 Signs may indicate an exception for bicycles in some areas. One hand or no-hands riding is forbidden. Maintain full control of your bicycle at all times. Carrying items on your bicycle that may cause an issue in traffic is forbidden. Such items include open umbrellas, saws, scythes, or other items that might cause damage or impaired maneuverability. The rule “don’t drink and drive” also applies to riding a bicycle. If your blood alcohol exceeds the limits, you can be fined and can possibly lose your driver’s license. This also applies to riding while being intoxicated or on drugs. It is prohibited to use a cell phone while riding a bicycle except when using a hands free capability. Any violation of traffic regulations carries a fine so make sure you respect host nation laws.